When did we declare war on trees? 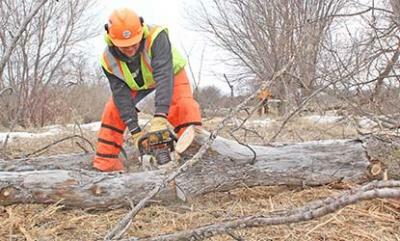 A crew from Carr’s Tree Service of Mankato removed undesireable trees and vegetation from the right-of-way north of Highway 212 and east of Morningside Drive Monday and Tuesday of this week in preparation for the Kwik Trip and possible AmericInn Hotel north of the highway. Desireable trees – cedar and crab apple – were left behind. The contract with Carr’s for tree removal was for $9,750.